Paris: car pound or bike pound? Motorcyclists in Paris have always enjoyed the right to park their bike on the footpath, as long as their machine does not obstruct the pedestrian right of way. The number of motorbikes and scooters in Paris have significantly increased in the last ten years, as Parisians now prefer to move around on two wheels which offer them a much more reliable, cheaper, faster and less polluting mode of transport. 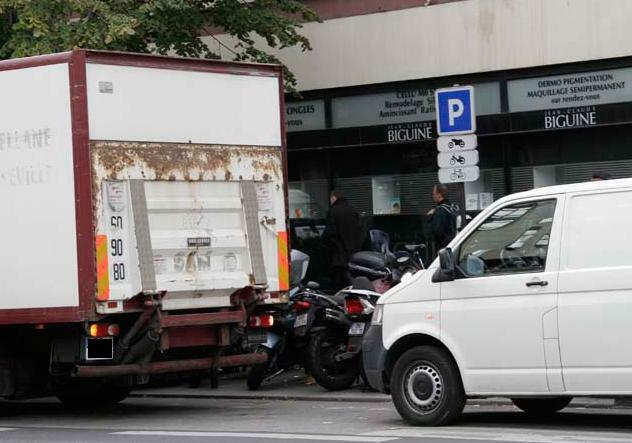 With the ever increasing number of motorcycles in circulation in the French capital, and thus the ever increasing opposition of bikers to any newly introduced anti-bike legislation, the authorities now seem to be taking draconian measures against motorcycle parking on pavements, which has always been permitted (or, in fact, tolerated). In the last week or so, hundreds of bikers have found their motorcycle, initially parked on the pavement without obstructing the footpath, moved into the pound without any notice. 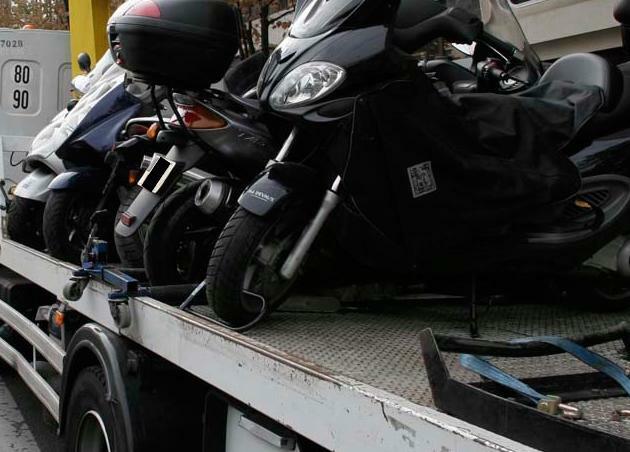 Many of the victims, who assumed their motorcycle had been stolen, phoned the police and were told that their machine had been taken to the pound for illegal parking. 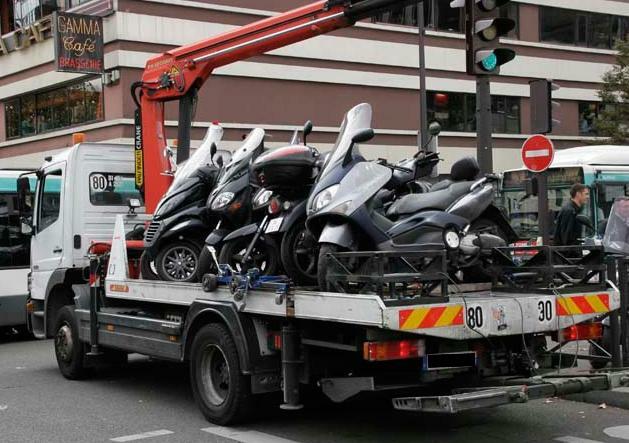 The unfortunate bikers who have had their bike taken to the pound, not only had to travel (by public transport) to the other side of Paris to pick up their machine, but also pay a large fine on the spot to have their motorcycle returned to them. But that is not all… most of them found their motorcycle severely damaged and also had to pay hundreds of euros to have their bike repaired. 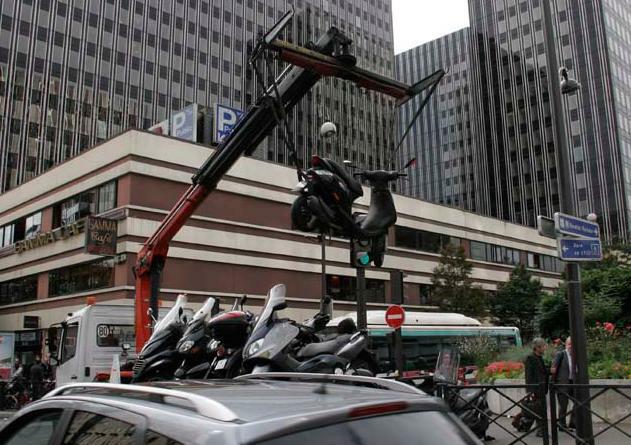 Have a look at the photos below, they show how the authorities remove motorcycles from their on-street parking spot using car removal equipment, thus severely damaging the bikes! This is just incredible! First, if you want to park your bike in one of the dedicated motorcycle parking bays whilst cars, lorries or vans are illegally parked just outside the bay making it impossible for you to reach it, those blocking vehicles are delibarately not fined to encourage them to stay and force you to park on the pavement, where your bike will be taken away to the pound... This is pure racket! 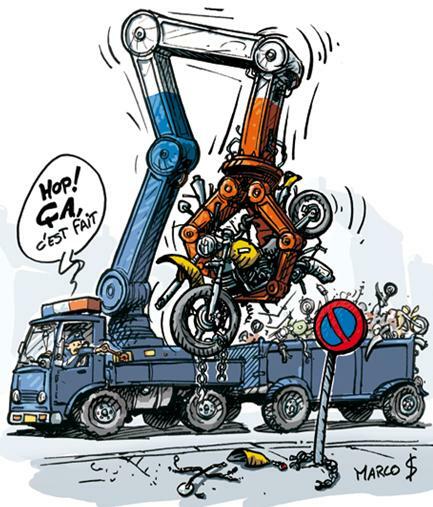 The bike is lifted with car removal equipment thus the risk of damage is extremely high... They lift the bike from anywhere, steering wheel, storage box at the back, front wheel, back wheel, absolutely anywhere, without worrying about the damage this may cause! The bikes are squeezed against each other without care on a car removal truck. The bikes are not securely fastened thus keep moving around and scraping against each other during the journey to the pound...! Ready to go! Bikers, see you at the pound and don't forget your cheque book or debit/credit card! Also, be psychologically prepared to find your bike severely damaged! thats absolutely disgusting and to make matters worse the people that are instigating all this were voted in by the same people that are being condemmed, its a totally pointless act of discrimination and set up purely as a money spinner, with less speed camera convictions partly due to the help of sat nav warnings they got to make there money from other souces, i think the demos should increase were being treated like scum, just a thought and i,m not to sure about this but if you write to a government office they are obligated by law to respond, so if all the 2 wheel fraternity wrote to the correct government office asking the reasoning behind all this we would block there system up, bit cheaper than petrol as a one off ???? As a first time visitor to Paris in late October, I saw motorcycles and scooters parked literally everywhere on the pavement. With the exeption of the area around the Eiffel Tower (where clear signs prohibited motorcycle parking) there were two-wheelers of every description outside shops; cafes; office buildings, all on the footway. No obstruction appeared to caused to pedestrians, and the bikes were all lined up neatly. “This is good: not like London,” I thought! A Parisian gent in a textile motorcycle jacket asked to look at my ticket and started shaking his head in disbelief. In case I ever decide to return to France (which is highly likely) on the same machine, I decided it would be best to just “shut up, and pay up”, rather than risk arrest and prosecution (and a trip to an impound yard to retrieve my pride and joy) so, after a trip to “La Tabac”, my wallet was a little over €35 lighter (one also has to buy two stamps to affix to the ticket which is then placed in a post office pillar box). 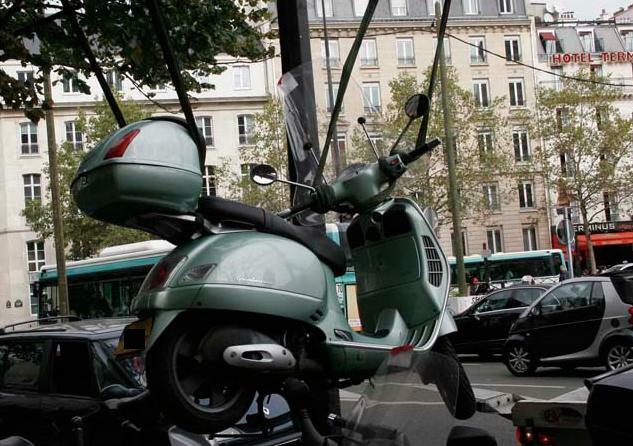 A salutory lesson: do not park on the pavement in Paris.